Pass thehttp://4.bp.blogspot.com/-BQkG2GG8xyo/UBSxrx_OVzI/AAAAAAAACfU/oTJ-PC_BZ Slipped Stitch Over: the new normal? The last few weeks here have not been good. Miss M continues to make progress and that is good. At the oncology clinic a couple of days ago the doctor pointed out to my son that many children have had three hospitalisations in the same time as she has had one. Admittedly that was a very long stay, but they are pleased with her progress. She still has oral chemo to take every day and she is susceptible to the winter coughs and cold and she tires easily. But she is generally OK.
Family matters have been terrible. There is a lot I cannot possibly talk about on here, but terrible hardly begins to scratch the surface of what I really think. There have been lies, tantrums, more lies, downright maliciousness and malevolence. I cannot believe that a matter which pretty well everyone would view with repugnance has been raised, seemingly lightly, and tremendous distress and family upset has been caused. All lies. How anyone could seem to treat the topic lightly I do not know. I have been knitting and finished a few things, although not all have been photographed as it slipped past my mind which was not in a good place.I found myself using the knitting to take my mind off other things. Knit fifteen, pattern, knit fifteen, pattern, and so on. It was very repetitive which was definitely needed by my brain which was darting everywhere at once, or so it seemed. I made a Cairn hat by Ysolda Teague for a family member who moved to upper Blue Mountains just before the biggest dump of snow there in years. It looks complicated but isn't, one colour being dealt with a at a time. I have made a couple of these before, but not for a few years. The person who received this is still working, although contemplating retirement soon. She leaves home before 6:00 am to walk to the station for the train to Granville where she changes. She returns home after 7:00 pm. Not a schedule I would want to keep for long, especially in winter which has been very cold. This one was for her husband, but I did not like the flare at the base. 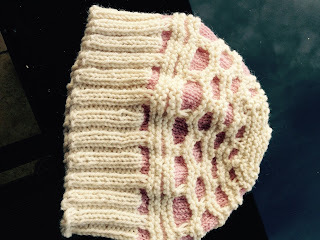 I used good wool, had tension and needles right. I ripped it all out. 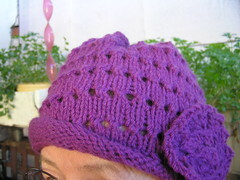 It is hard to tell but the top part is made of Quince yarn, Owl, I think. Dark khaki. The cream is the 8 ply Shetland which Bendigo sold a few months ago. It is pleasant to knit with and is undyed. In one way it was annoying to rip it out. In another way, the very knitting of it was a help to me, so I am just putting it down to experience. It all helped me in dealing with nastiness and more. I made a hat from the ebook Head to Toe which I bought last year. This was for a friend of my son, lovely person. I can't find a photo of that although I am sure I took one. She had a birthday so I made a cowl for her from double thickness of Bendigo sock year in variegated blues. This had an easy repetitive pattern which took little thought, freeing my mind to think about other things. It is cosy, made from two strands of yarn but is soft against the skin. She loved it and had no idea the knitting she had been admiring was actually for her. It was somewhat of a surprise to open the package. She works in long day care child care and is outside a lot of time in what has been a very cold weather. 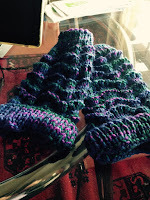 I also made her some fingerless gloves in her colours, blues, green and a dash of purple. I made the wrist part longer so there were no gaps between gloves and sleeves. This is a poor photo but the feather and fan pattern can be seen, again something which did not need great deal of concentration for me. My son has had a lot of support from a group of guys who seem to have his back covered for him. This is needed as we often cannot see what is coming next. We can see the direction it comes from, but not necessarily see the blow till it arrives. I made a Milkweed Shawl For the wife of one of these fellows. They have fed him once a week for months, and supported him in many ways. I have made the pattern several times before and I enjoy it. Enough pattern to stop boredom, not enough complex knitting so my brain made mistakes. Apparently she loved it. Does not do craft herself and so had a great surprise. 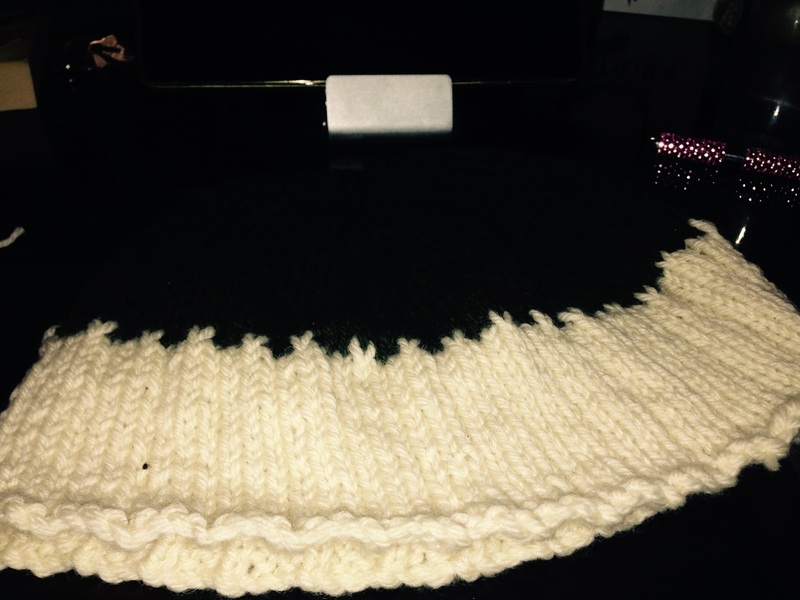 I felt I was in some way returning the support they had shown my son.This is being blocked and I have not yet reached the bottom centre of the shawl, so it looks out of shape. It is finished now. 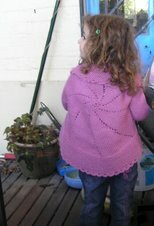 Finally, http://www.ravelry.com/patterns/library/mara-3, Mara, by Madeline Tosh for myself. Lots of repetitive knitting of garter stitch which is very soothing. I am almost down to the ribbing on the edge. I am not really anticipating this with pleasure as the stitch count doubles for the 2x2 ribbing. I'll get there. ((Hugs)) It sounds so hard for you. I'm glad your granddaughter is doing ok. And all your knitting is lovely - when I am severely stressed I like to knit socks, as I have memorised a plain pattern that fits my husband (and with minor modifications my daughter or myself) that I can do without concentrating. I really hope things pick up a bit. Very pleased that Miss M is doing so well. Very good news. Not so nice in the other area. I an glad that there are friends to support and that you have your knitting to help. The nice repetitive movement of the needles and the counting is a nice comforting kind of yoga I think. I do like the two colour hat and the shawl is a beautiful colour!!! Oh Mara is such a nice pattern,. I shall have to add it to my very long queue. Take care, The Labradors send a snuggle. Their snuggles are very good and usually come with long happy stares. I'm glad to hear that your sweet granddaughter is making progress. I'm not so glad to hear about the other dramas and traumas affecting you Jan. It is sad and sorry when family problems are on the horizon. It's hard to think of anything else. I hope you and yours get some resolution soon. Your knitting is absolutely lovely. Just had to tell you that.